Dramatic scenes at the Astros County offices as Cockroach was admitted to an Asylum for the Terminally Frustrated after covering the last four Astros games - all losses - including a sweep at the hands of the East New Mexico Rangers. When I saw him last, he was rocking back and forth, hugging his knees to his chest, and muttering incomprehensibly about BABIP and TOOTBLANs. Last heard, he is in receipt of treatment with sedative medication, and recovering quite well. An MRI on his Bloggers Collateral Ligament has revealed no damage. Get well soon, Cockroach! The Astros entered this game after Keuchel and McHugh combined to keep the Rangers and Red Sox (respectively) off the scoreboard for only two of the 10 innings they combined to pitch as part of the recent rotation. Most of the innings that resulted in scoring were of the single-run variety, but when your top two starters manage back-to-back starts when they put their team in an early hole, that is unlikely to signal ongoing team success. So the Astros turn to nominal number-three starter Mike Fiers to try and stop the bleeding, and give the bullpen a bit of a break. Mike Fiers leads the league in home runs given up, so perhaps this matchup was going to be tough for the Astros. But Fiers was mostly effective while the Astros managed two innings where they hung a squiggly number on the scoreboard. The 'pen did a good job of holding on, working around a bunch of runners on the base paths. Colby mashed a fifth-inning grand-slam in front of a crowd of 40k on a lovely spring evening in Houston, with the roof open. A good result, as the Astros win, 8-3. The game was interesting in the sense that both starters struggled early, then settled down and looked pretty dominant, then struggled again on the third time through the order. In the first, Fiers allowed a single to Mookie Betts, then Betts headed to second on a throwing error. This was followed by a Pedroia walk and an Ortiz single, scoring one, and putting runners on the corners with no outs. However, Fiers bounced back to minimise the damage, striking out Han-Ram and Travis Shaw before getting Brock Holt! to ground back to the mound for the last out. That put the Astros in a 1-0 hole, but Fiers settled down, retiring the side on a strikeout and two grounders in the second, and allowing only an infield single to short in the third (which I think could have reasonably been scored an error on Carlos Correa). In the fourth, Fiers struck out two in a perfect frame, and in the fifth, the Sox were set down in order on a three consecutive outfield catches. Staked to a 5-1 lead, Fiers entered the sixth frame, facing the Sox for the third time. Dustin Pedroia doubled to lead off the frame, then David Ortiz struck out on a gem of a curveball down for the first out. Han-Ram walked on four pitches, before Fiers allowed a hard line-drive single to RF, which demonstrated the penalties associated with having a short second baseman. That put runners on the corners for Will Harris, who allowed Pedroia to score on a sac-fly before enticing Chris Young into a groundout, in a bizarre at-bat in which Harris threw three strikes that were not called. 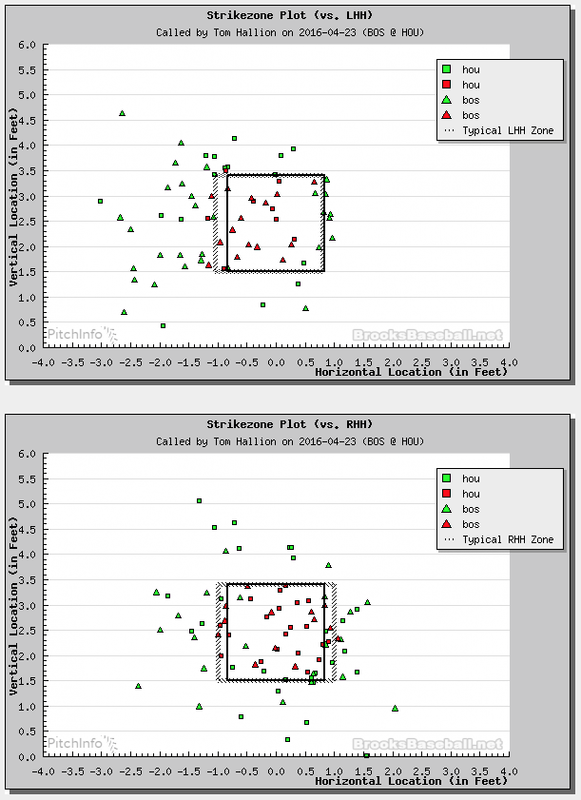 (In defence of Tom Hallion, the home-plate ump, the batters box was in shade while the mound was in full sunlight at this point, so perhaps his task was a little harder than it looked). Fiers' line was pretty reasonable, going five-and-one-third, allowing seven baserunners (2 walks, 5 hits) while striking out six, allowing two runs (both earned). Fiers seems - at least in his non no-hit bids - to struggle late into the game, which may be understandable given his slightly odd over-the-top delivery to the plate, which would put a heap of strain on his torso and hips. So there may be a fatigue-related reason for his extra late-game struggles, which seem to be based primarily around a deterioration in command. As mentioned above, Harris relieved, and he was again excellent - having only been scored upon in his first appearance of the season. Neshek allowed one seeing-eye single in the seventh while striking out one in a scoreless frame. Ken Giles found himself in a spot of trouble again in the eighth - he seems to be getting BABIP'd a bit at the moment. David Ortiz took an inside fastball and fisted it over the infield, then, with two outs, Brock Holt took a fastball away and flicked it into LF for another single. Pinch hitter Josh Rutledge followed with a double just inside the LF line on a slider inside, scoring Ortiz. Giles bounced back to get Jackie Bradley to fly out to the LF power-alley - a play in which Rasmus and Gómez collided briefly, with Rasmus holding on to the catch. Josh Fields got the ninth after the Astros established a five-run lead in their half of the eighth. Fields looked really good (as he often does when he isn't giving up runs), setting down the side in order on a groundout, fly-out, strikeout sequence. More, uh, interesting times for the Astros at the plate and running the bases tonight. For example, the first two hitters in the first reached on two singles, but the next three Astros all hit infield flies to continue their team-wide RISP woes. In the second frame, Carlos Gómez popped up to shortstop to make it four infield flies in a row, before MarGo (starting at first) dragged up perfect bunt down the first-base line for a single. Luis Valbuena followed with a double on a low fastball into the RF corner, sending MarGo to third. Then Jason Castro doubled his RBI total for the season on a groundout to second base that scored González. That levelled the scores early. 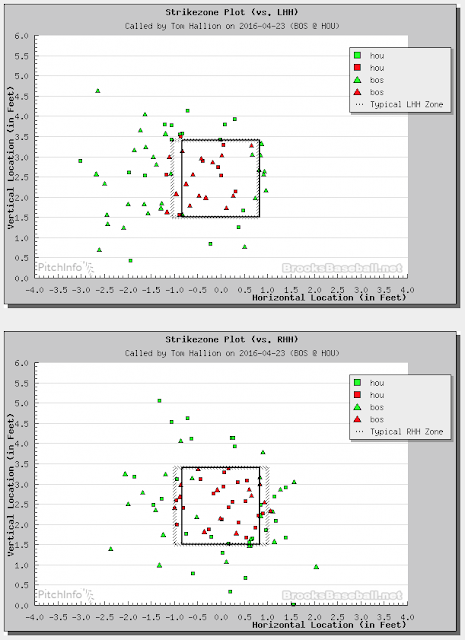 Buchholz looked dominant after that. He struck out five of the next seven batters before walking Luis Valbuena to open the fifth. After Castro's line out to RF, José Altuve grounded into a fielder's choice, with Travis Shaw at third-base making a diving play that Pablo Sandoval wouldn't have managed. Then, with two outs, George Springer (2-4, BB) singled on a hard liner up the middle that Dustin Pedroia couldn't corral going to his right, and Carlos Correa (who was being pitched inside all night) was hit by a pitch, loading the bases. That brought Colby Rasmus up, and after running the count to 2-0, he swung and missed at two consecutive curveballs, evening the count. The fifth pitch of the at-bat was meant to be a running fastball down and in, but Buchholz missed arm-side, and Rasmus got a low four-seamer over the middle of the plate. A hard line drive sent it into the RF stands just to the right of the bullpen, sending the crowd into a frenzy, and giving the Astros their second grand-slam of the young season. Luis Valbuena walked in the sixth with two outs, but Castro (0-4, RBI) struck out thanks to some Tom Hallion fancy strike-calling. More TOOTBLANs in the seventh, as lead-off José Altuve hit a line-drive that dropped perfectly between Jackie Bradley Jr and Mookie Betts in RF, and got past them. Altuve dug for third, but didn't slide in, and was tagged out on a perfect relay throw just before he got his foot on the base. Opinions were divided on the commentary and in the Twitterverse whether the blame lay with Gary Pettis or Altuve, but the outcome was the a run was wasted, as the Astros preceded to load the bases with a walk, a single and another walk (to Rasmus). Evan Gattis (0-2) pinch hit for Preston Tucker (0-3), and he struck out looking on a laughable curveball that nearly hit him, and was recorded by the telecast as being in the RH batter's box. (To Gattis' credit, he said nothing and walked away, but for a guy who is struggling some, it seemed like a cruel call). Carlos Gómez (0-4) grounded out on the next pitch to end the frame with no runs scored. The Astros sealed the game in the eighth - an inning where they mashed four doubles. MarGo (2-4, 2B) was batting righty (against ex-Mariner LHP Roenis Elias) when he doubled deep into the LF power alley. Luis Valbeuna (2-2, 2xBB, 2x2B) followed with a double to a similar spot (the other way for Valbuena), then José Altuve (3-5, 2x2B) mashed one to deep RF that bounced into the Astros' bullpen. Colby Rasmus (2-4, 2B, HR, BB, 5 RBI) doubled into the RF corner, and only a slick play from Mookie Betts (to cut the ball off before it hit the wall, spin, and accurately hit the cutoff man) stopped Carlos Correa (1-3, BB, HBP) from scoring. Two-out, two-strike Grand Slams are always welcome. Rasmus hadn't looked good on the curveballs on the previous two pitches, but when battery-mates Buchholz and Vázquez agreed to try and sneak a low fastball past him, Rasmus was ready. The result was a hard, low fly-ball, and Rasmus got enough of it for a no-doubter to the RF stands. Rasmus certainly wins the MoTM, with his 2-4, HR, 2B, BB night, raising his triple-slash to .302/.449/.698 on the season. But a number of other Astros also had really good nights, and while their efforts will not result in the formal presentation of MoTM-y awards, they deserve mention in this space. Luis Valbeuna went 2-2 with two doubles and two walks. José Altuve went 3-5 with two doubles and is now hitting .314/.415/.629 on the season. George Springer went 2-4 with a walk. MarGo went 2-4 with a double. Will Harris did well as a fireman in the sixth, and Pat Neshek and Josh Fields worked a good frame each. The lazy answer here is one of either Carlos Gómez, Jason Castro, or anyone who played DH for the Astros (combined 0-5, 2K, 2 infield popups). But Gómez had perhaps the best non-productive at-bat of the night (an 11-pitch battle in the sixth) and Castro had an RBI and only struck out once (progress!). At least one of the strikeouts of the DH's was... uh... marginal. Tom Hallion also perhaps deserves a mention in this space, but his job wouldn't have been easy with the plate in shadow and the mound in sun for three or so innings in the middle. But, uh, robot umps, anyone??? At least both teams seemed equally hosed. 8 Eastern, 7 Central. On ESPN, I think, too. After that game, the Astros fly to Seattle for a series against the Mariners that kicks off with a night fixture on Monday evening. That was a really fun game to attend. Fiers was surprisingly effective and the offense finally got some big timely hits. I don't know about the lovely Houston evening with the roof open, that sun was scorching hot on the first baseline seats, as it tends to be in these late afternoon games..